Recently, we’ve seen some lawmakers talking the benefits of the Trans-Pacific Partnership, including President Obama and 6th District US Rep. Tom Emmer. The Delano Republican’s endorsement is interesting, considering he’s never seen the whole of the TPP agreement. No member of Congress has. Only the 600 corporate negotiators know what’s really in it, which doesn’t inspire much confidence. US Rep. Keith Ellison (MN-5th) is one of the several members of Congress who have requested it but still hasn’t gotten it. All we can go on is what actual trade experts think will transpire if TPP becomes law. The consequences of the TPP are frightening, especially for anyone who routinely uses prescription drugs or depends on a living wage. For starters, the TPP would establish an agreement for tariffs and trade provisions in 12 nations, including the US, Australia, and Japan. Some provisions would be equal, others wouldn’t. One that appears to be unilateral has been pushed by pharmaceutical companies. They hope to be able to hold on to “data exclusivity” for 12 years. That means any research on new drugs is proprietary, and it will delay the release of generic drugs from any of these nations until well past the point when a patient needs them. The cost of drugs will go up, even for veterans, who are charged less than market rate. ICU nurses see patients regularly who have to be placed on a ventilator due to heart failure simply because they couldn’t afford their life sustaining medication, medication that in many cases, costs the pharmaceutical company pennies on the dollar to actually make but because they are beholden to their shareholders, they mark-up the costs to ensure a hefty profit denying patients the ability to purchase the medication they desperately need. This “trade” agreement further entrenches these practices and puts public health at risk. Public health is not something that should be up for trade. Because corporate regulations would be the same across TPP nations, corporations would be free to sue governments with rules or requirements that impact their business. This already exists under the North American Free Trade Agreement, but it would be greatly expanded under the TPP. It’s not crazy, and it’s already happened with countries being ordered to use taxpayer dollars to make up lost profit a corporation experiences due to laws that protect consumers. All the regulations the US has pioneered to protect its citizens, from food safety to environmental protections, could be challenged and overruled. With such a low bar, policies that encourage the hiring of US companies and their US workers would be gone too. US federal contracts could go to any nation. “Buy local” incentives would be history, meaning companies would be encouraged to offshore even more services such as IT support, customer service, even HR and accounting. President Obama touts TPP as a “progressive” deal because it would require all nations to stick to their respective minimum wage laws. That’s pretty meaningless when each country has a different minimum wage, and some don’t have one at all. By far, the most maddening aspect of TPP is its secrecy. The fast track approval process means our elected representatives in Congress won’t see it until it’s done, and it’s not up for debate. They’ll either have to vote it up or down. This flies against the very words in the US Constitution (Article I, Section 8) that guarantee our local representatives in Congress the exclusive authority to determine the terms of trade policy. If TPP is such a terrific trade deal, the public, through its elected representatives, should be allowed to have a full and open debate to ensure this agreement really is in the best interest of the American people. Summing up, we give away our rights to decide our future, our good jobs, our living wages, our consumer and environmental protections, and our ability to buy cheaper product including drugs that could save our lives. In exchange, we get next to nothing. That doesn’t sound like a very good trade at all. As a result of the assault against staff at St. John’s Hospital last November, the hospital removed bedside poles that could be used as weapons. While this action may prevent future violence, it’s too late to help the nurses who were attacked that day. Provide training to all health care workers on safety guidelines, the incident response plan, how to properly de-escalate situations and request additional staff, and the worker’s rights regarding acts of violence. In addition, HF 1087/SF 1071 prohibit hospitals from interfering with a healthcare worker’s right to contact law enforcement or the Minnesota Department of Health regarding an act of violence, and establishes an electronic violence prevention database, which will allow the state to track trends in violence against healthcare workers at a hospital level. The violence against healthcare workers bill could go a long way toward preventing potentially violent or abusive situations we have all experienced as bedside nurses. Furthermore, it will prohibit hospitals from preventing or discouraging nurses from reporting abuse from patients or visitors, which we know is a common problem. Unfortunately, the Minnesota Hospital Association would rather enact harsher punishments on perpetrators of such violence rather than prevent the violence in the first place. MHA claims that nurses can already report safety lapses to the Office of Health Facilities Complaints, but this argument displays little understanding of how healthcare workers can interact with state agencies. Both MDH and its commissioner tell MNA that OHFC investigates only complaints against facilities that are violating current law; when a patient assaults a worker, the facility has not violated current law, and therefore a complaint against the facility would fall outside the jurisdiction of OHFC. The hospital association also claims that the violence prevention bill is a ploy to enable nurses to report safety issues to the Minnesota Department of Health; but as MHA itself stated in a letter dated August 13, 2014, to MNA President Linda Hamilton, they view nurses as statutorily obligated to report unsafe staffing to the Department of Health and state that “allowing hospitals, the Board of Nursing, or the Office of Health Facility Complaints to actually address any legitimate concerns” is of paramount importance. Thus, on one hand MHA views the violence prevention bill as a ploy to enable nurse reporting to MDH, but on the other hand views such reporting as mandatory and of paramount importance. MHA needs to take a hard look in the mirror and accept some responsibility for a flawed system, which does little to nothing to prevent violence in the healthcare setting, ignores nurses who ask for resources to help prevent a brewing problem from exploding, and discourages nurses from reporting violent or abusive situations to the relevant authorities. Instead of punishing sick and delusional patients even more for their abhorrent actions, let’s prevent them in the first place. Let’s remove the pole before it is used as a weapon. RNs at Sanford Bemidji Clinic ratified their first contract in February after being officially recognized as part of MNA last October. RNs say they’re happy to have a contract that protects patients and nurses alike. “We’re excited about having a contract that protects our rights and ensures we’re all treated fairly,” said negotiating team member Christine Sheikholeslami. “The new contract creates a wage scale, so raises are allocated fairly and consistently,” said member Tina Hawver. Previously, managers gave raises arbitrarily. The contract raises wages for all members, creates security in scheduling, and provides all other contract language to the Clinic RNs that hospital employees receive, such as more affordable health insurance and a cap on mandatory low-census days. In 2017, the hospital and clinic nurses will bargain together for a new contract as one united group. The bill to prevent violence against healthcare workers (HF1087-Atkins/SF1071-Wiger) continues to make progress in both the House and Senate, with bipartisan support. The bill will be heard in the Senate Health and Human Services and Housing Committee on Wednesday, March 11 at noon. Please attend if you are able! The high profile incident last year at St. John’s Hospital in Maplewood received lots of press, and along with the introduction of this bill, has raised awareness about the serious problem of violence in the health care setting. However, many legislators do not understand the real scope of the problem. Have you ever experienced violence in the workplace, either at the hands of a patient, family member, or other visitor? Please write to your legislators today, tell them your story, and ask them to support the Violence Against Health Care Workers bill. 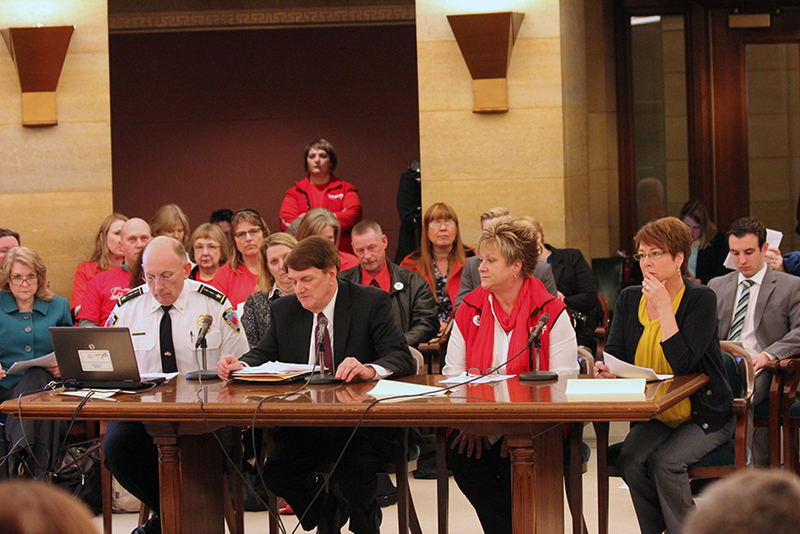 On Wednesday MNA nurses testified at the House Health and Human Services Finance Committee hearing on HF261, a bill to establish a certification for a Community EMT. 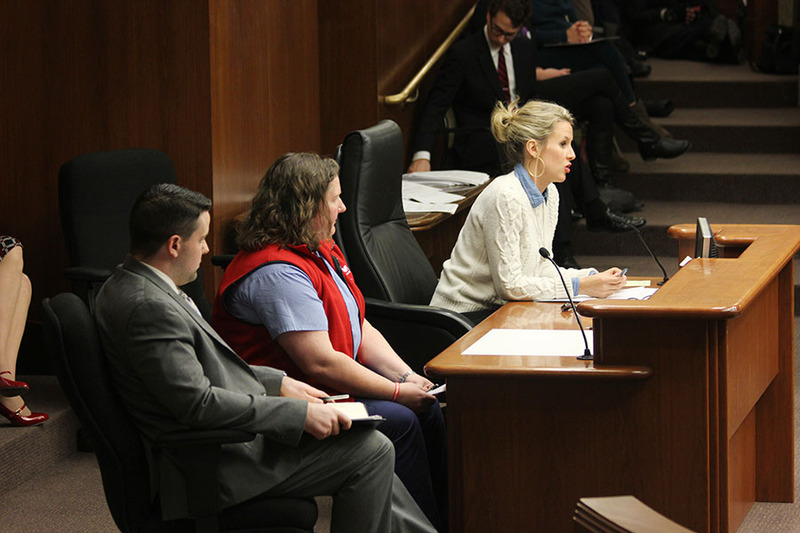 The bill, authored by Rep. Tara Mack of Apple Valley, aims to prevent hospital readmissions by sending a CEMT to visit a patient within a day of discharge from the hospital. MNA shares the goal of improving public health by giving patients more time and more care, but we are concerned that the new CEMT would be performing the duties of a Public Health Nurse, which CEMTs are not educated or trained to do. Our campaign to establish a minimum standard of care for patients that protects patient safety through safe staffing is continuing to gain support at the Capitol. Rep. Joe Atkins (DFL-Inver Grove Heights) has again agreed to take on the bill. Atkins needs nurse stories of unsafe staffing situations as well as patient stories about not receiving safe or quality care while in the hospital. If you or your loved one have ever experienced an unsafe staffing situation as a patient, please go to this website page and write your story. Your story comes straight to us at MNA, and you can choose to include or leave out any personal or medically sensitive details. The website is www.safepatientstandard.com/patient-stories. You can also email any stories straight to us at stories@safepatientstandard.com. Today the Wisconsin Assembly passed a Right to Work law, which now moves on to Governor Scott Walker for his signature. “Right to Work” makes it harder for workers to join together to work for better wages, benefits and working conditions. “Right to Work” is being pushed nationally, not by workers, but by big political donors who favor corporate interests over working people and the middle class. Right to Work will affect bargaining units in Wisconsin represented by MNA. Most Wednesdays we bring small groups of nurses to the Capitol to meet with legislators about our priority bills. Our next visit, March 11, has been “adopted” by the nurses of Methodist Hospital. All MNA members are welcome. We’ll meet at the MNA office for a briefing and a quick training on talking to legislators, and we’ll carpool to the Capitol to talk to elected officials about the need for Safe Patient Standard and Workplace Violence Prevention legislation. We’ll return to the office around 1:00 pm and have lunch available. Please contact Geri Katz geri.katz@mnnurses.org or Eileen Gavin Eileen.gavin@mnnurses.org for more information or to sign up. Dealing with discharged patients continues to be one of the most confounding problems with hospital care. Nurses often don’t have the time to give patients all the education they need when they leave the hospital. The result: many go home confused, unable to care for themselves, and unsure how to get better. 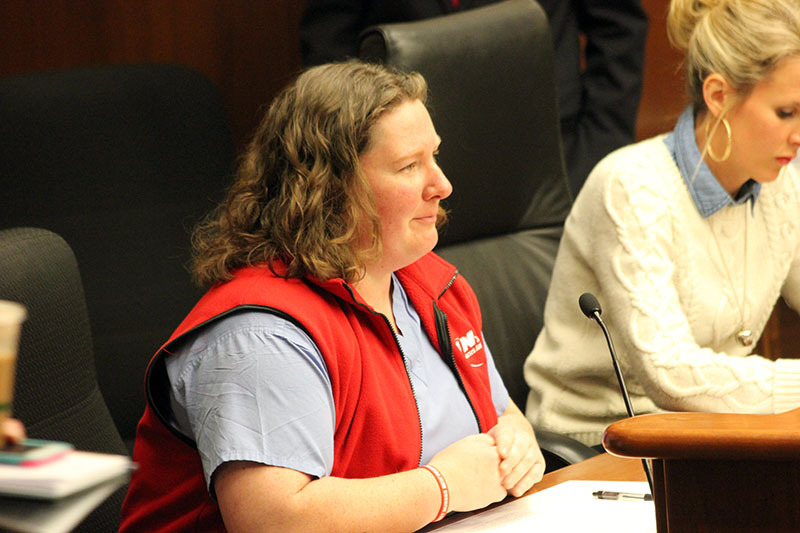 Rep. Tara Mack (R- Apple Valley) Community EMT bill (HF261) enables EMTs to visit discharged patients the day after they get home, but the bill doesn’t actually specify what CEMTs can and can’t do. The result could be agencies that allow CEMTs’ work to infringe on what nurses are specifically trained and prepared to do. 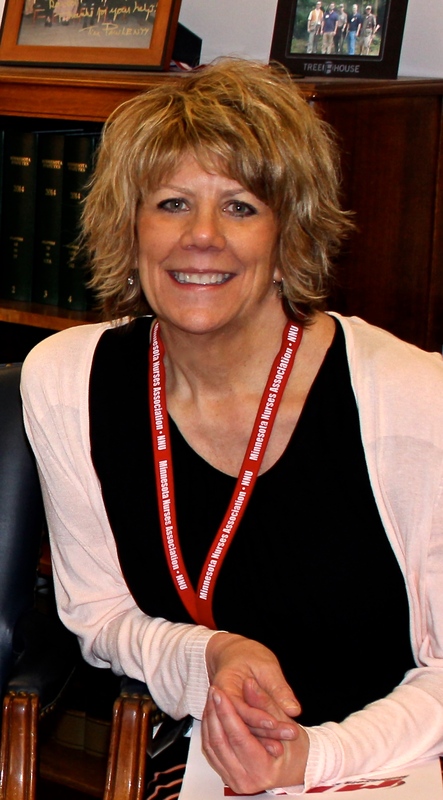 Enger testified at the House Health and Human Services Policy Committee hearing on the bill that she’s seen the effects of firefighters, EMTs, and paramedics who visit discharged patients already. Agencies in the west Metro, including Edina, St. Louis Park, and Eden Prairie have already begun the CEMT program with the help of Methodist. “Edina and Burnsville use volunteer firefighters and there’s a clear difference in what we learn about a patient coming in with those departments versus one who comes in from a paramedic from North Memorial, Allina, or HCMC,” Enger said. The Chief Nursing Officer at Methodist, who testified for the bill, confirmed that they still get many questions on the hospital nurse triage line even with the program. The bill also has the support of the Professional Fire Fighters Association, which claims that 80 percent of their firefighters’ work is now healthcare. MNA Nursing Policy Specialist, Mat Keller, pointed to the many problems that still exist in the legal language of the bill. He noted that the language allows CEMTs can do anything to intervene that prevents emergency department caring for the patient. He said that could include anything from administering IVs to delivering a baby. Even proponents of the bill admit that CEMTs would probably only spend 15-20 minutes with a patient during their visit, which doesn’t allow for a proper assessment. Rep. Erin Murphy (DFL-St. Paul), an RN, mentioned her time caring for patients at the bedside and in the home setting. Murphy urged “more work “ on the bill to delineate tasks and eliminate any infringement on the scope of practice. Rep. Mack admitted that another issue to be worked on is which Minnesota board will oversee CEMTs. The bill names the Emergency Medical Services Board, but, as Keller noted, these actions would only be non-emergency situations. HF261 was passed over for possible inclusion in the final Health and Human Services bill. MNA will continue to visit the Capitol with nurses to work with legislators on making the bill something that can truly benefit the patients of Minnesota. Last week, Rep. Joe Atkins introduced the Violence Against Health Care Workers bill, an effort to prevent workplace violence in the health care setting. 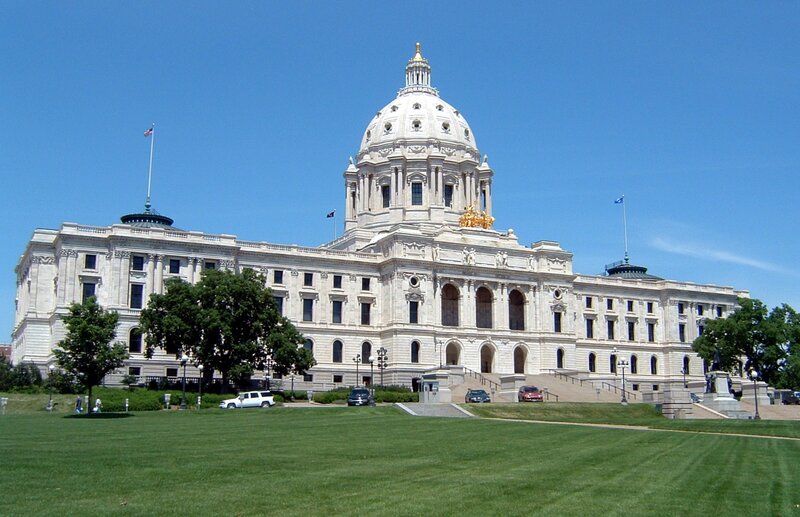 We are pleased that the House bill has bipartisan support with Republican Representatives Greg Davids and Nick Zerwas joining DFL Representatives Atkins, Erin Murphy, Karen Clark, Joe Mullery, Frank Hornstein, Leon Lilly, and JoAnn Ward as co-authors. This week, Senator Chuck Wiger introduced the Senate companion to the bill, SF1071. Co-authors are Senators Chris Eaton, RN; Scott Dibble and Barb Goodwin. Please stay tuned to learn about upcoming opportunities to advocate for this bill. Please say thank you to Senator Wiger for introducing this important bill! His office number is 651-296-6820 or you can send him an email using this form. The deficiency funding bill passed yesterday in both the House and Senate and was presented to the Governor today with the compromise language on commissioner pay raises, which had been the sticking point. 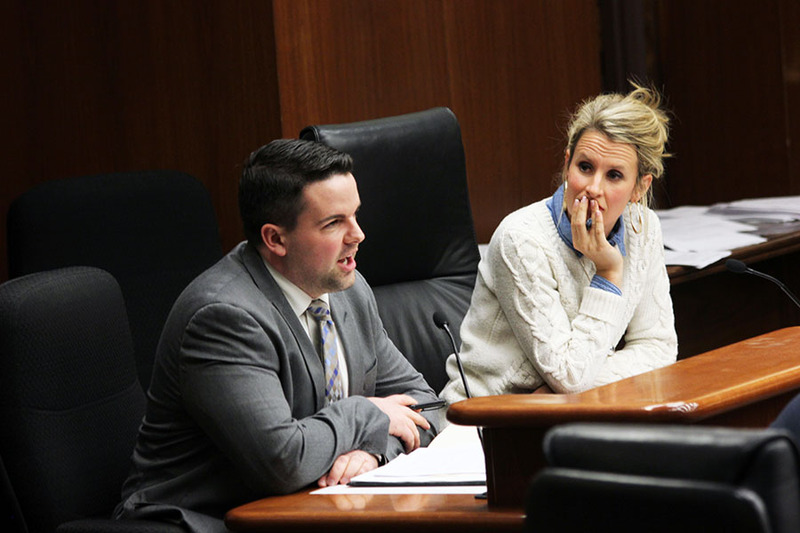 The bill includes funding for the Minnesota Security Hospital as well as Ebola-related costs. On Wednesday, about 400 nursing students from all over Minnesota came to St. Paul to learn more about why MNA nurses take patient advocacy from the bedside to the Capitol. MNA member leaders were there to welcome the students to the most trusted profession, and invite them to join us in advocating for a Safe Patient Standard, workplace violence prevention and health care for all. Most Wednesdays, we bring small groups of nurses to the Capitol to meet with legislators about our priority bills. Our next visit is March 4. We’ll meet at the MNA office for a briefing and a quick training on talking to legislators, then we’ll carpool to the Capitol to talk to elected officials about the need for Safe Patient Standard and Workplace Violence Prevention legislation. We’ll return to the office around 1 p.m. and have lunch. Please contact Geri Katz at geri.katz@mnnurses.org or Eileen Gavin at eileen.gavin.mnnurses.org for more information or to sign up. Released today, the February budget forecast projects the state will have a $1.8 billion surplus in the next biennium. Minnesota’s economy is making a strong comeback after the recession, with one of the lowest unemployment rates in the country. Expect the Governor and legislative leaders to debate how to use those funds: tax cuts, additional spending and investment, or a combination of both. As you probably already know, Governor Scott Walker and Republicans are trying to pass a so-called “Right to Work” law in Wisconsin. This legislation, crafted by corporate special interests, would weaken workers’ rights across the border. Tomorrow, there is a solidarity rally in Madison. Minnesotans can catch a bus from Hudson, WI (right across the border). The bus will leave from the park and ride lot at Interstate 94 and Carmichael Road at 7 a.m. The rally starts at noon at the State Capitol in Madison. Let’s show our brothers and sisters in Wisconsin that Minnesota’s working people stand with them! 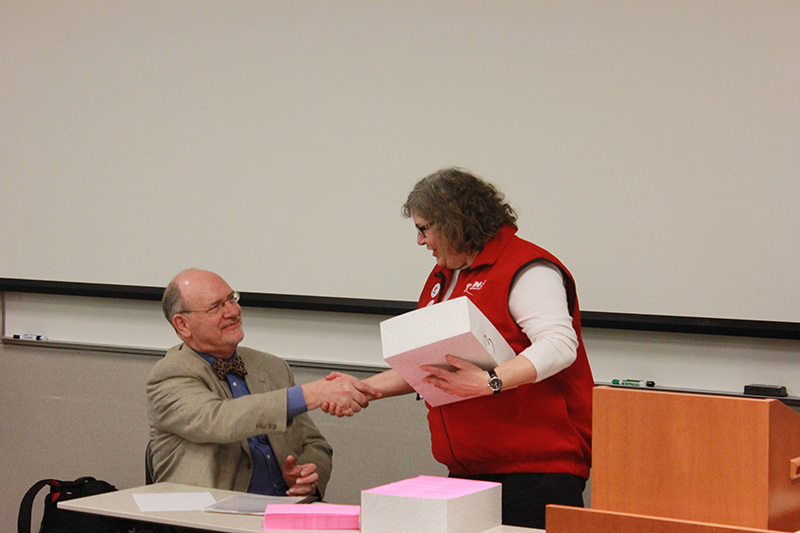 100 nurses delivered more than 2,000 Concern for Safe Staffing Forms to Commissioner of Health Ed Ehlinger. They lined up to tell their stories of unsafe staffing situations and the effects it has on patients. Negotiations with Essentia Health in Deer River started with a “contraband” cake and ended with our members ratifying a contract that improves compensation, stems the tide of RNs leaving for better-paying jobs in nearby hospitals, and strengthens our union solidarity. Bargaining got off to a bumpy start last September when we served a cake decorated with the MNA logo to passers-by in an area near the hospital lobby to kick off negotiations. Administration asked us to leave and canceled the next day’s negotiating session. The “contraband cake incident” helped unite members. We all saw that a good contract was achievable only if we stood together. Communication. We kept everyone updated by phone, text, in person, and on MNA’s website. Members knew they had the latest information at all times. Teamwork. Members realized we needed to fight for what we should rightly have, and worked together to win a good contract. We wore buttons and stickers to show we supported each other. Many members became union stewards to show our solidarity. That gave management a scare! We all became familiar with the existing contract, so we knew what to change to make our hospital a better place to work. MNA support. Nurses in Duluth and Virginia stood and showed their support for us. Our labor representative, Adam Kamp, guided us and made sure we negotiated the important issues. Beside having a good contract, we now have a better working relationship with Essentia. The hospital saw that it needed to invest in nurses in order to keep the hospital healthy and agreed to the contract. 150 MNA member nurses came to the Capitol in St. Paul to tell lawmakers they want a Safe Patient Standard and that nurses and patients are not safe in the workplace. Nurses from St. John’s Hospital in Maplewood describe horrific night when a patient suddenly attacked them. MNA nurses are fighting for workplace safety for all healthcare workers in all facilities.